John Vias’ images, taken using long exposures that freeze a moment in time, allow others to see the life and colors of the night captured in a tree’s translucent leaves, a wall’s repeating patterns, a bridge’s sensuous curves. His night watches reveal the beauty of everyday objects during the subtle curfew of the dark. For Mr. Vias, photographing at night is like shooting a movie all in one frame. Time is compressed; movement is frozen. What remains is stillness and quiet. Our hurried lifestyles often keep us from seeing the shapes and patterns that fill our everyday travels through the world. His work is an invitation to slow down. To see. To reflect. 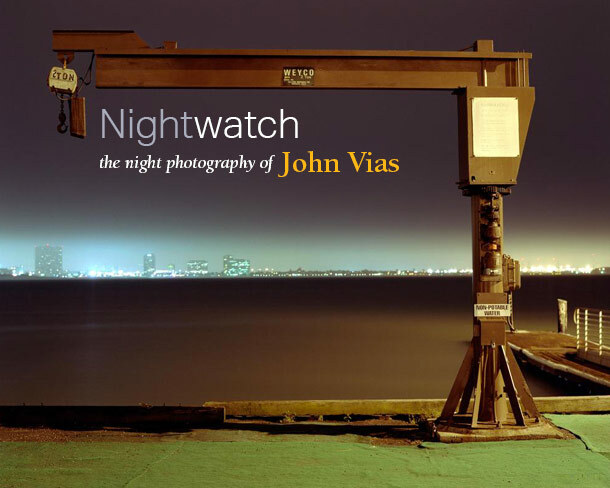 John Vias' award-winning night photography has been exhibited in solo and group exhibitions in galleries and other venues throught the Bay Area. His work hangs in public, private, and corporate collections across the U.S. and overseas and has been recognized in several juried shows. Mr. Vias was born in Illinois. He earned a BA in English from the University of Florida and a Certificate in Photography from UC Berkeley Extension. He lives and works in Berkeley, California.